Owing to the rich experience, we have established ourselves as the most famous firm involved in offering a broad spectrum of excellent quality Metal Paint Can. we are engaged in providing an extensive gamut ofMetal Paint Cans.These cans are fabricated by our professionals while keeping in mind the various needs & requirements of our clients. Our products are in compliance with the predefined industrial as well as international quality standards. Our company holds vast experience in this domain and is involved in offering Unlined Can. 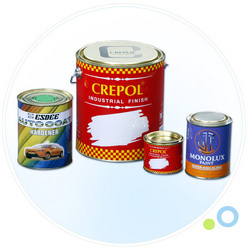 We are engaged in manufacturing and supplying supreme quality of Tin Containers for paints. For the fabrication of these containers, we use superior grade tin that ensures the quality of the end products.